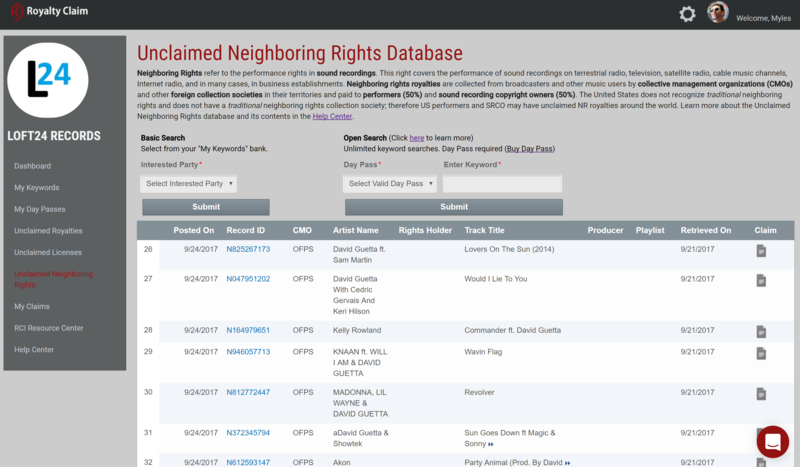 Today, we are excited to introduce our Unclaimed Neighboring Rights database containing nearly 1 Million records of unclaimed tracks, unregistered performers, and unregistered master owners based on data retrieved from collective management organizations (CMOs) and other foreign collection societies around the world. Neighboring rights refer to the performance right in sound recordings. 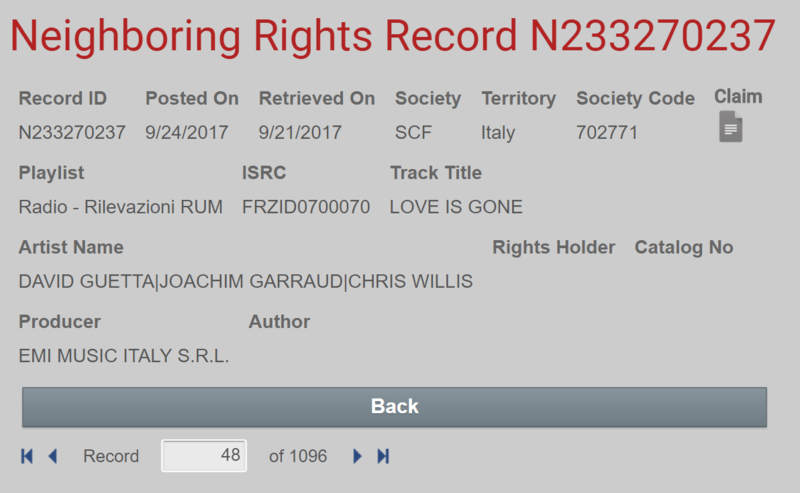 Neighboring rights royalties are paid out to performers and master owners similar to the way song copyright royalties are paid to writers and publishers. However, the United States does not recognize traditional neighboring rights. US broadcasters are exempt from paying performers and labels when sound recordings are performed on terrestrial radio or TV. 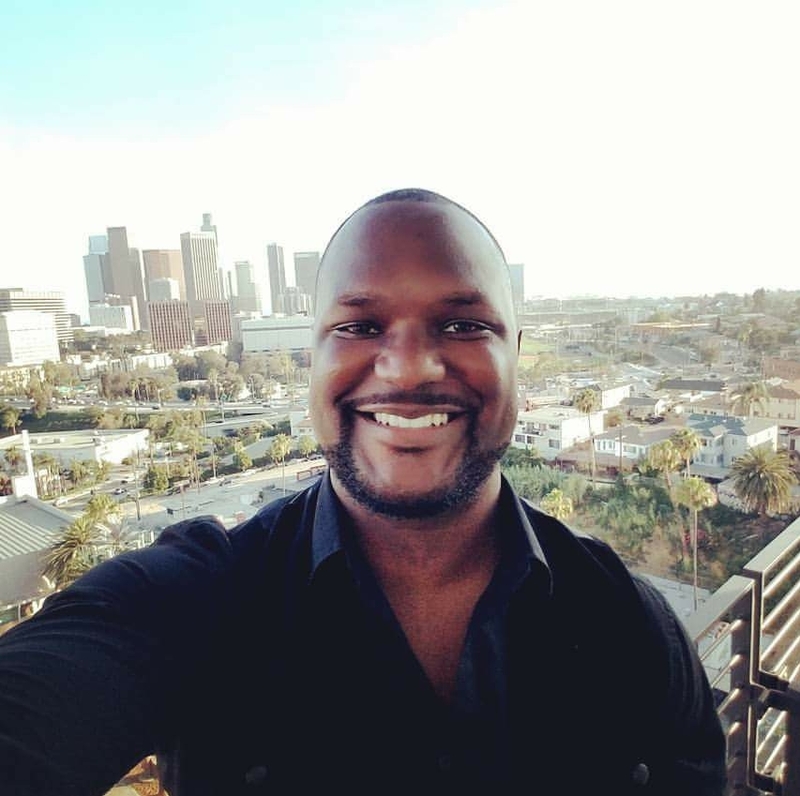 As a consequence, the United States does not have a traditional collection society for the collection and payment of neighboring rights royalties. The closest thing to neighboring rights in the United States is the digital radio royalties collected by SoundExchange for digital transmissions only. 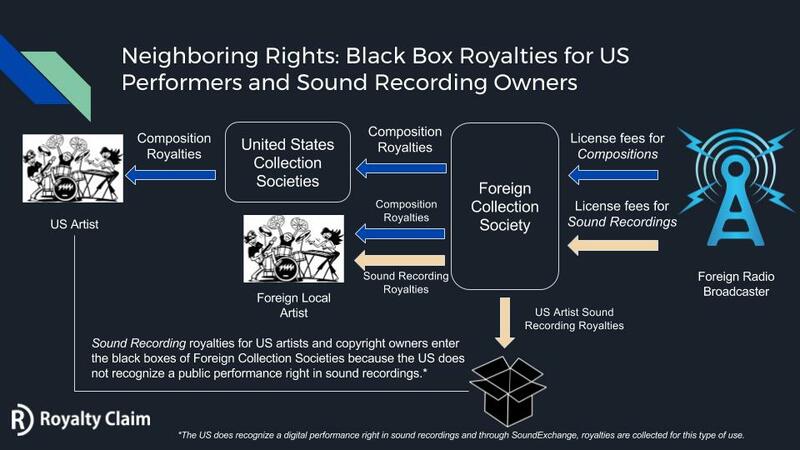 Because the United States does not have traditional neighboring rights, it does not have reciprocal agreements in place with CMOs and collection societies around the world to exchange neighboring rights royalties owed to performers and master owners when sound recordings are broadcast. Therefore, collection societies withhold any neighboring rights royalties that may become due to US based performers and labels. Millions of instances of performances of sound recordings from US based performers and master owners go uncollected everyday as a result of this problem. These royalties end up what is known as the "Black Box" and often redistributed to the members of the collecting society based on market share (with the bulk of the funds going to the obvious major players). It is really unfair to US performers and master owners that their music is performed around the world, but your ability to collect performance royalties is limited by US copyright laws, which prevent non-US performers and master owners from earning royalties from the broadcast of their sound recordings in this country (except for digital transmissions). While there are neighboring rights agencies that will sign-up master owners and collect foreign performance royalties on their behalf, they are selective and it's even worse for performers. Due to the amount of work and the high cost of setting up a performer for collection, neighboring rights agencies are highly selective regarding who they work with. This is why a central database of neighboring rights entitlements would be useful to performers and master owners. We're not there yet, but we hope to continue to grow our Unclaimed Royalties Database and partner with CMOs and other collection societies to provide us this data. Spotify, Google, Amazon, Microsoft And Others Filed Over 12 Million New Address Unknown Section 115 NOIs In The Second Half of 2017…And We Have Them All.